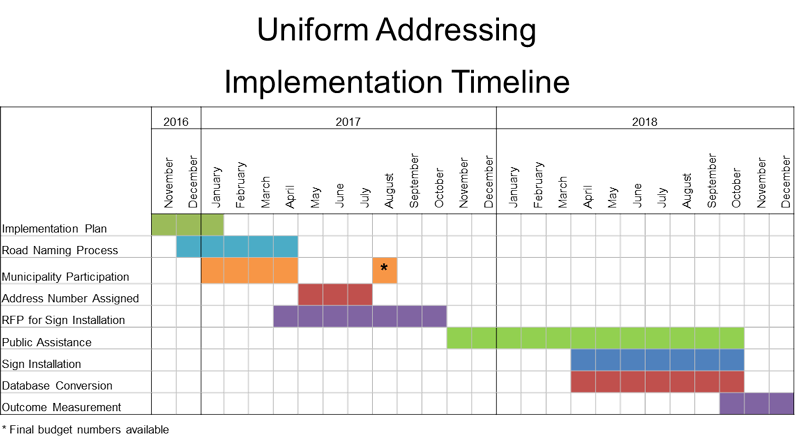 In February 2016, the Marathon County Board adopted policy to implement a uniform addressing system. What this means is that instead of the current ten rural address grids, there will be a uniform grid. (Read the ordinance.) Uniform addressing will enable public agencies, especially emergency services, to provide the right service to the right place at the right time. In response to concerns from local municipalities regarding the financial implications of the proposed uniform addressing system policy, Marathon County has elected to pay $1.2 million to cover the cost of the uniform addressing system. Town participation is required because Marathon County has jurisdiction over addressing in unincorporated areas. Marathon County has offered its villages and cities an opportunity to participate in the new addressing system to promote the strategic goal of being the safest county in Wisconsin. Use the following links (or click here) to see which roads your community will need to rename. Please note: Roads that traverse through adjacent counties and/or non-participating municipalities need further discussion. If you have any questions or concerns, review our Frequently-Asked Questions or contact Marathon County CPZ at 715-261-6000 or cpz@co.marathon.wi.us.